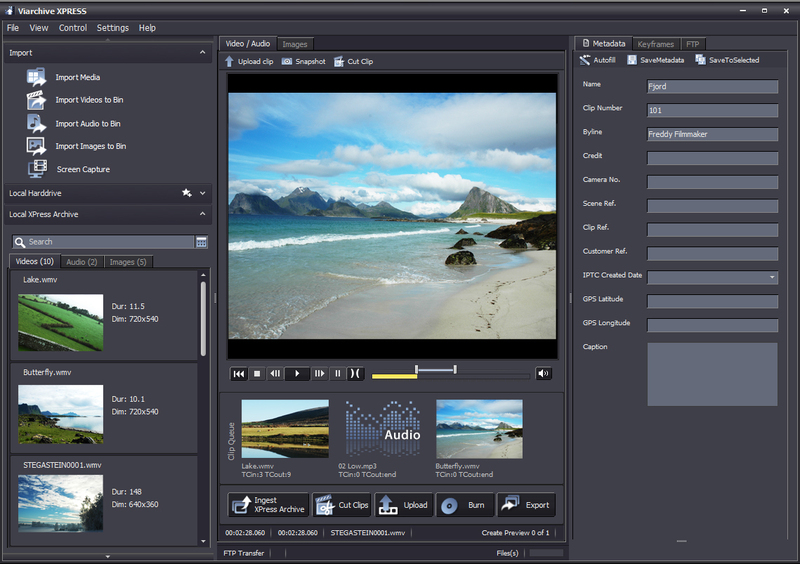 ViArchive XPRESS is a product developed to facilitate precise uploading of videos and segments of videos to archives. Users can prepare files for upload by cutting and transcoding, and edit / enter metadata before uploading to the video archive. As the metadata is added before upload, the videos are instantly searchable in the online archives. The software is developed with the special needs of environments in mind, where only segments of video files are of interest to upload to the archives, like for example surveillance, police and defense. The software is also used in research, media and corporate organisations. ViArchive XPRESS is a desktop application for Windows. 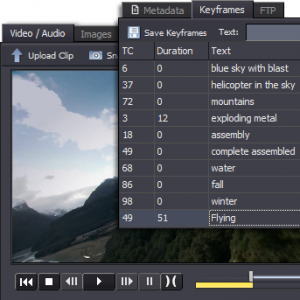 Cut/Transcode, MXF files & Capture: Users can prepare files for upload by cutting and transcoding clips. Cutting out a segment is quick and user friendly. Entire files may be transcoded as well. The solution supports the H264 / AAC codec (mp4 and f4v). Users may also cut and transcode files in batch. ViArchive XPRESS supports unwrapping MXF files and has a screen capture function. Metadata: Users can easily add or change file info and keywords. The metadata layout is fully customizable in the template editor included in the application, and can be configured with masks for accurate filling in i.e. serial numbers etc. XPRESS also allows users to add searchable keywords to key frames and to durations along the time line of clips, which can be used for clip navigation. ViArchive XPRESS provides an autofill function for adding metadata by an ODB Connection. Archiving: ViArchive XPRESS provides for both server and hard-copy archives. Video files texted and ready for uploading to the archives can be added to an upload queue and uploaded by batch. You may also cut, transcode and upload in one action. The application also features burning of data DVDs, and a local archive on the workstation. Users of ViArchive XPRESS can access server archives and execute actions on archived files. This allows users to search archived content, adjust metadata on files, organize files in project folders, cut, transcode & download files from the archive, directly in the desktop application. 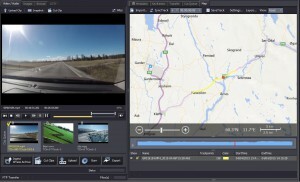 Working with maps: ViArchive XPRESS provides a map module which allows users to sync videos with GPS data along the timeline. A video file and a GPX file (containing GPS points recorded along with the video recording) can be paired and synced. This means that for example a clip which was recorded from a moving vehicle can be accompanied by a map of the route the vehicle was driving. Current location in the map is also showed as you play the clip. The map module can also be used to view and edit images GPS location. Read more about the map module. ViArchive XPRESS includes user friendly features which contributes to a streamlined workflow which is easy to understand and quick to use. Import media: ViArchive XPRESS features an import media panel where the user can browse and view the content of various data sources. The import media panel allows users to keep original file names or use templates to rename files. Batch actions: XPRESS provides batch actions which makes it fast and easy to execute the same action on multiple files at once. Import media from camera or local harddrive and add your selected clips or segments to the queue. Then you can for example add metadata, cut, transcode or upload all files in one operation. Customizable application layout: The option to blend out not needed functionality from the application and float/dock application windows, contributes to the user friendly workflow. Metadata templates are fully customizable. Find out more about ViArchive at www.viarchive.com or contact us for more information.